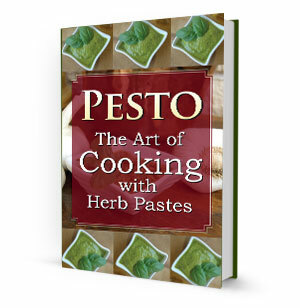 This Gourmet Cookbook has 143 pages and provides a collection of over 30 pesto variations and over 60 recipes that will add a new dimension to your favorite pasta and add life to salads, vegetables, meat, poultry, seafood, and even pizzas! Many fine Italian restaurants get their variety by using Pesto and now so can you! This ultimate guide to pesto making is sure to keep you busy cooking and enjoying for years to come.